Having written a time-travel novel myself, I can understand how difficult continuity can be to ensure the story makes sense. In Time of Destruction, the continuity of events is certainly there, but it lacks in so many other areas as to make it almost unreadable. While the continuity of the timeline was well thought out, the continuity of details was not. From limiting the “time bubble” to 30 minutes of air, then allowing an antagonist to exist in the space for a full hour, to inconsistencies in the spelling of minor characters’ names (even on the same page), Time of Destruction has a good story buried deep within a mess of simple writing errata. Right from the start, the format of the book highlights the author’s lack of quality control. From the right-hand pages having the page number in the gutter margin to the right-aligned text to inconsistent tabs, spacing, and section breaks, these visual clues immediately gave me the sense that this work was rushed out the door. Once I started reading, I found the context to be poorly written. Aside from dialogue that was consistently the same (“Blah blah,” character 1 SAID. “Blah blah,” SAID character 2, “blergle bah blah.” “Blah blah,” SAID character 1. Ad infinitum, even in two-person dialogue), on every single page, I could probably find a dozen proofreading errors, including missing punctuation, an almost obscene avoidance of hyphenation, and homophone abuse. In a book that’s nearly 400 pages long, these errors add up to over 4,500 moments where I was distracted from the story. 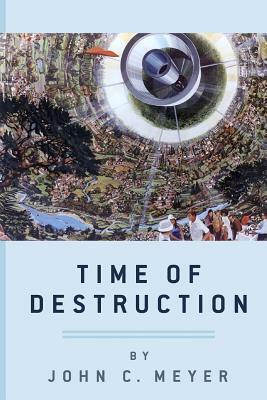 As for the story itself, I did appreciate some of the accuracies in how long it would take to rebuild society after an apocalyptic event. However, there were a few plotlines which were unnecessary (like the events on Earth immediately following the titular “time of destruction”), and some of the characters acted in irrational ways to get the result the author wanted (the romantic pairing of the time travelers seemed forced and unnatural from the start). Furthermore, the author’s vision of the near future (2085) is practically the present we live in right now, with regular space travel being the only advancement in the next 68 years. This book might have worked better as two separate books, covering the destruction of Earth and the time-travel aspect to prevent it, respectively. As it is right now, the ending doesn’t make sense, and there’s too much “filler” to justify a book of this length. A neat idea, riddled with errors most High School students could fix, I give Time of Destruction 2.0 stars out of 5.